Built in Glasgow by the Govan shipping company, the Carthaginian was launched by the Allan Line on October 9, 1884. Her maiden voyage on December 6th, 1884 had her sailing from Glasgow to Boston. Her identical sister steamship – the Siberian – was also built the same year. The Carthaginian mainly sailed with emigrants and other passengers between Glasgow or Liverpool to Quebec, Halifax, Baltimore, Philadelphia or Boston. There was accommodation for 64-1st, 32-2nd and 1,000-3rd class passengers on the single funnel, three mast steamship. Over the years, 2000 British Home Children in total, sailed across the Atlantic to Canada on her decks. In the Sessional Papers of 1887 on the Settlement of Children to New Brunswick and Ontario in 1886, the Carthaginian was mentioned in a report to the Minister in Agriculture by Miss Sliman. 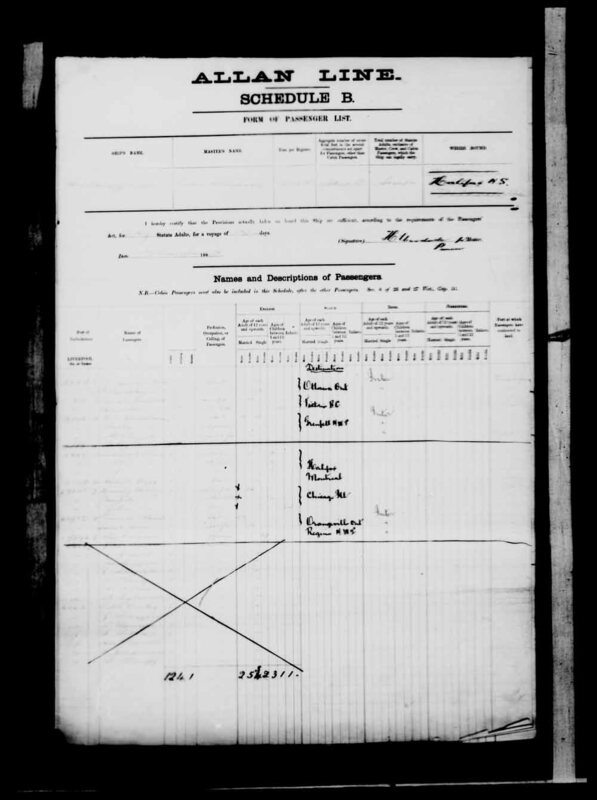 Miss Sliman brought children to New Brunswick and to Miss Billbrough, the matron of the Marchmont Home in Belleville, Ontario. “In giving a brief report on my visit to New Brunswick and Ontario, I find it not quite easy to select and compress all I could wish you to know. 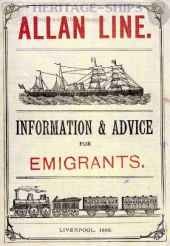 I sailed on the 12th of October from Liverpool by the Carthaginian steamship, taking with me 13 girls and 9 boys. “Our voyage was rough and tedious, but we arrived in safety on the 23rd of October. Without any delay we got train and after twelve hours of comfortable cars, we reached our destination, St. John, N. B., on Sabbath the 24th. In 1913, no British Home Children were sent on the Carthaginian. That year, in January, on their first voyage of the year, the captain, crew and passengers of the ship experienced tumultuous weather and high waves from the moment they left Glasgow on December 26th causing the captain to remain on the bridge constantly. As the ship came to within 500 miles of St. Johns, it was discovered the some produce in the hold had caught on fire. At first, the news of the fire was kept from the passengers for several hours while the crew battled it. However, soon the passengers were called together and told that they must pitch in, in order to save the ship. The passengers, including two Scotch women, joined the bucket brigade or manned the nozzle of the hose to battle the blaze. Several times, Captain McKillop contemplated abandoning ship but decided if they did so, they would certainly all die a watery death. After nine hours, the hold was flooded and the fire extinguished. The Carthiganian lay low in water but was able to continue. She was in service for the Allan Line from 1884 till 1915 when the entire Allan line was taken over by Canadian Pacific. 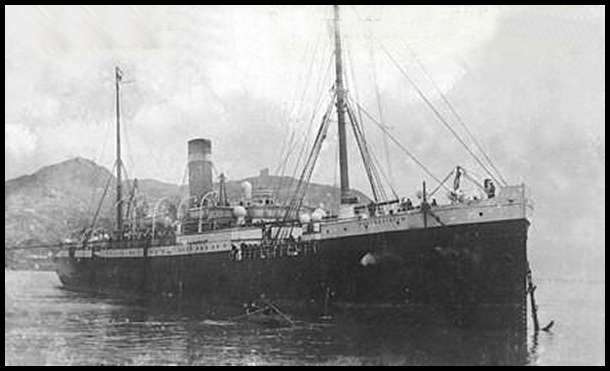 The Carthaginian’s luck finally ran out on the 14th of June 1916, On that date, she was sunk by a mine laid by the German Submarine U79 near Inishtrahull, off the coast of County Donegal. Fortunately, there was no loss of life.